Home Grown Mountain Biking Tours is happy to present the Summer Ladies SKILLZ & THRILLZ Clinic! This clinic is for women only who currently ride at an intermediate level. 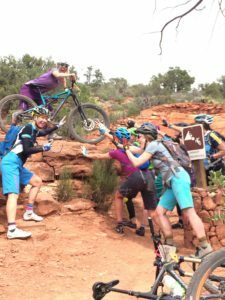 Professional Mountain Bike Instructors will provide a safe environment to progress your abilities on the bike, and help you apply those skills on Mt Lemmon trails. This “all-mountain” style of riding offers fast descents, technical climbs, swoopy corners, drops & rollers, switchbacks, steep terrain, and off-camber single track. While these trails require a higher level of skill to navigate, they are incredibly rewarding and fun! PREREQUISITE: MUST BE ABLE TO RIDE PRISON CAMP TRAIL WITH CONFIDENCE. ACCESS TO A TRAIL MOUNTAIN BIKE** (Full Suspension, 5+ Inches of Travel, and Dropper Seat Post Recommended). **HG has demo & rental bikes available. Additional details will be posted soon!